What with the concern and ongoing headlines about carbon dioxide (CO2), other greenhouse gases and climate change, it's safe to say that American consumers are genuinely concerned about the environment and want to behave responsibly. They are not scientists, however, and simply need to have a better understanding of the environmental issues, in less scientific terms. So in language that Main Street America will understand, here's what responsible consumers need to know about CO2 and why incorporating U.S. Hardwoods into their homes and businesses will lessen climate change. By itself, CO2 is not bad. In fact, CO2 plays a key role in the overall balance of life because it and other gases help to determine the temperature of the Earth. The concern is that certain human activities are significantly increasing the amount of CO2 and other "greenhouse" gases. The overabundance of these gases is trapping too much heat in the Earth's atmosphere - heat that should otherwise escape into outer space. And as a result of this undesirable "carbon footprint," the Earth's temperature is rising and our climate is changing. But there is better news and it involves forests and the process of photosynthesis. By virtue of nature’s magnificence, trees are carbon neutral and the work that they do – reduces greenhouse gases in the atmosphere. In simple terms, here’s how. Growing trees remove carbon dioxide from the atmosphere and separate the carbon and oxygen atoms. They use just the right amount of carbon to grow roots, trunk, branches and leaves. They store the unused carbon and return oxygen to the air. Another natural process, transpiration, helps to cool the atmosphere as growing forests pump moisture back into the air – all the brilliant handiwork of Mother Earth. That brilliance has created a building material which demonstrates the least negative impact to our environment. That material is wood – perhaps the quintessential "green" material and not to be confused with grasses or other tropical flora masquerading as wood, but the "real deal" - ever renewing, abundant and sustainable, U.S. grown hardwoods. In addition, studies have shown that it takes less energy to make products from wood than other materials - products made from aluminum, glass, plastic, cement and brick can require as much as 126 times more energy than making them from wood. Moreover, virtually every part of a log is used as lumber or a wood by-product and finished hardwood products are re-useable, recyclable and biodegradable. Across the world, scientists, environmentalists and politicians are calling on everyone to take action to lessen their individual carbon footprints. Consumers can accomplish just that by incorporating more U.S. hardwood products into their homes and businesses. Choose, request, specify furniture, flooring, mouldings, millwork and cabinetry made from U.S. hardwoods, the environment's friendliest material. 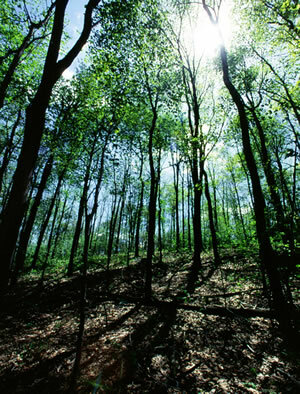 To learn more about the positive environmental impact of U.S. hardwoods and to research other environmental issues, visit these helpful sites, www.HardwoodInfo.com, www.corrim.org, www.cei-bois.org, www.carbonfootprint.com.